Our Los Gatos trenchless sewer replacement professionals are there for you if you are having a problem with your sewer lines. We have the tools, training, and technicians necessary to handle all your trenchless sewer replacement needs. The sewer line in the average home or business handles tons of waste materials each year. Over a period of time, the sewer will become old, rusted, and damaged and need to be replaced. Instead of suffering the inconvenience of having a work crew dig up your yard to replace your sewer, opt for Campbell or Los Gatos trenchless sewers. Give us a call at (408)215-4612 to see if your property is eligible for trenchless sewer repair/replacement today. 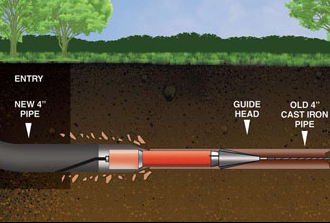 We have been doing trenchless sewer repair in Los Gatos and Cupertino for years, so we have perfected the process. We can come into your home or business and repair or replace your sewer without having to dig up your entire yard or tear out your walls/floors. That makes the process faster and eliminates all the hassles and the inconvenience of having holes and mud all over your property. When you choose trenchless sewer replacement in Los Gatos, the process is clean, fast and effective and doesn’t damage the area around your building or your landscaping. When we finish your trenchless sewer repair, your property looks just like it did before the work began. Our process is simple. First we do a thorough inspection of the sewers. Next, we use epoxy and our cured in place piping (CIPP) to repair problem areas or redo the entire sewer pipe. Within minutes, the job is done and your sewer pipes work like new. Our Morgan Hill and Los Gatos trenchless sewer replacement process is fast, simple, clean, and effective. Our inspection will show if you need a complete sewer pipe replacement or if repairing the sewer pipe will suffice. We’ve been doing trenchless sewer replacement for years. We have experience working with both commercial and residential structures. No matter the age of your property, the combination of our thorough inspection, epoxy, and incredible CIPP process, will leave your sewer pipes functioning like new. Trenchless sewers last for decades without any problems. That’s why a growing number of people request our San Jose and Los Gatos trenchless sewer replacement instead of the traditional way of repairing or replacing their sewer pipes.